Kathmandu, A sculpture exhibition is presently running at the Nepal Art Council. The visitors would encounter a mammoth sculpture as they enter the exhibition gallery after climbing a flight of stairs to the first floor. On first glance, the sculpture looks like a big bull is sitting right in front of you on the street. Lord Shiva is mounted on this big bull. This sculpture made by youth sculptor Shyam Krishna Shrestha is nine feet tall. Shrestha worked on this piece of artwork made from fibreglass for 10 months. It weighs 300 kilogrammes and the artist claims that it will last a century. "I have depicted Lord Mahadev mounted on the bull above the cloud. My conception is that Mahadev is ready to go in the battle between the gods," Shrestha said explaining the concept behind the sculpture. The artist expects that this sculpture will sell at Rs 9 million. 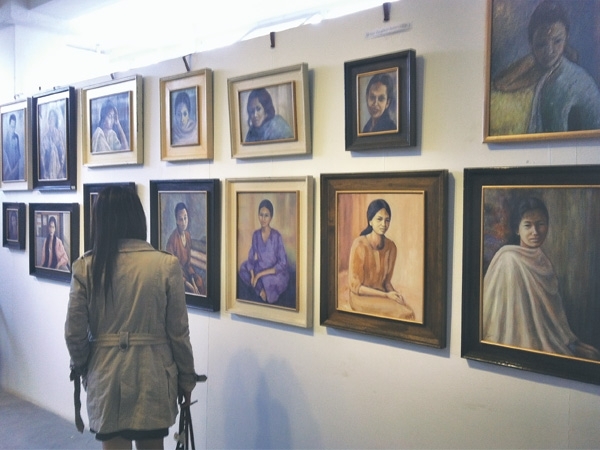 This is Shrestha's maiden sculpture exhibition. He holds an MFA degree in fine arts from Nepal Fine Arts College. Most of the sculptures on show are on the theme of tradition, religion and identity of the Newar culture in Kathmandu. A total of 22 astonishing sculptures made in a period of four years have been kept on display and sale. These sculptures made from wood, marble, terracotta, mixed medium among others are titled – dreadful consequences, pain of giving birth, the tunes of constraint, existence, from the beginning of struggle, day and night, imploration, Buddha, the wait of excitement, love etc. These sculptures are priced in the range of Rs 20 thousand to Rs 300 thousand. Talking to RSS, artist Shrestha said his creations have given him satisfaction and dignity more than money. "I have become successful in expressing my conceptions and through these sculptures," he added. The exhibition concludes on December 23.